What are the best skills for kids to have these days? In today’s technology-driven world, is it best for children to hone their science and math skills to catch up with other countries that outperform the U.S.? Or is it best for them to be more well-rounded, with strong arts and athletic skills as well? Or perhaps parents should instead focus on encouraging less tangible skills in their kids, such as teamwork, logic and basic communication skills. The answer was clear. 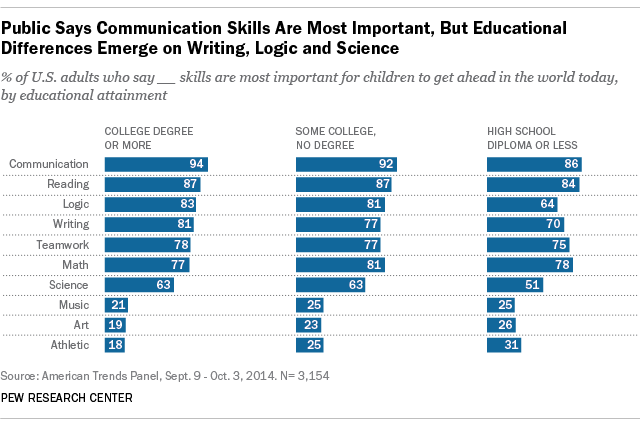 Across the board, more respondents said communication skills were most important, followed by reading, math, teamwork, writing and logic. Science fell somewhere in the middle, with more than half of Americans saying it was important. Rounding out the bottom were skills more associated with kids’ extracurricular activities: art, music (sorry, right-brained people) and athletics. There was virtually no difference in the responses based on whether the person was a parent of a child aged 18 and younger or not. Older Americans, the cohort who are likely to be grandparents of today’s children, are more likely than younger adults to say it is important to stick with science and math. Some 64% of adults ages 50 and older say science skills are important to get ahead, compared with just over half (54%) of younger adults. There was a similar gap between older and younger adults when it comes to math skills (83% vs. 74%) and a smaller gap on reading skills (88% vs. 84%). Younger adults put a higher emphasis on logic, with 77% saying it was important for kids to get ahead compared with 71% of adults ages 50 and older who said the same. When we looked at differences among adults based on the political party they identify with, there was as much agreement as disagreement about the necessary skills for today’s youth. Democrats and independents were more likely to say science skills were important, with 61% and 59%, respectively, citing that skill, compared with just 52% of Republicans. Democrats and independents also put a higher value on learning about music, a skill that just 17% of Republicans agree would be helpful for kids to succeed. On the flip side, Republicans (78%) and independents (77%) were more supportive of logic skills, compared with 70% among Democrats. There were some slight differences when it comes to race and ethnicity. Compared with others, whites were less likely to say that music, arts and athletics were important for children. On each measure, there was at least a 10 point gap between whites and blacks or Hispanics. For example, 36% of Hispanics and 35% of blacks said arts skills were important to get ahead, but just 19% of whites said the same. Similarly, 42% of Hispanics and 34% of blacks said athletic skills were important, but only 20% of non-Hispanic whites said the same. And about a third of blacks and Hispanics, versus only one-fifth of whites, cited music as an important skill. Note: This survey was conducted through Pew Research Center’s American Trends Panel, a nationally representative panel of randomly selected U.S. adults. The survey was conducted Sept. 9-Oct. 3, 2014, among 3,154 respondents and had a margin of error of 2.7 percentage points. Topline results can be found here.